Who invented the Model T? The name of the person credited with inventing the Model T is Henry Ford (1863 - 1947). Henry Ford is not only famous as the American inventor of the Model T but also as a businessman, industrialist and the founder of the Ford Motor Company. When was the Model T invented? Henry Ford invented the Model T in 1908, during the Second US Industrial Revolution / Victorian period of invention (1850 - 1914). The invention of the Model T originated in America and is considered a paramount achievement in the field of Transportation. 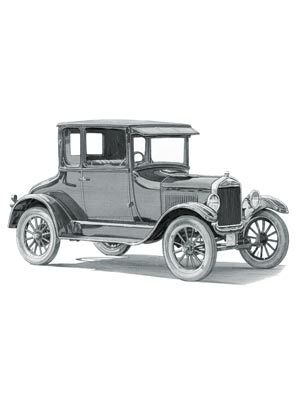 Definition of the Model T: The Model T is defined as an easy to maintain and inexpensive automobile, aka the 'Tin Lizzie', that was mass-produced in the early 1900's with completely interchangeable parts by Henry Ford and the Ford Motor Company via an innovative moving Assembly Line pioneered by Ransom E. Olds. Fact 1: Who invented the Model T? The Model T was invented by Henry Ford in 1908 during the Second US Industrial Revolution era of inventions (1850 - 1914). Fact 2: Who invented the Model T? Prior to the invention of the Model T in 1908, the first gasoline car was invented by Karl Benz in 1886. The prices of the very first automobiles were expensive but the introduction of the Ford Model T made cars affordable and accessible to many more Americans. Fact 3: Who invented the Model T? The inventor of the Model T, Henry Ford, was born on July 30, 1863 in Dearborn, Michigan, United States and died on April 7, 1947. Fact 4: Who invented the Model T? The early years of Henry Ford were spent in Dearborn farm in Greenfield Township, Wayne County, Michigan, United States where he was raised by his family. Fact 6: Who invented the Model T? His parents were William Ford, who was born in Ireland, and Mary Litogot, an American. Henry Ford was the eldest of six children and was educated at local schools and showed a flair and interest in machinery, mechanics and engineering. Fact 7: Who invented the Model T? Following his education his first job was in 1879 as an apprentice machinist at the James F. Flower & Bros shipbuilding firm in Detroit. He completed his apprenticeship with the Detroit Dry Dock Company and in 1882 returned to the family farm and took a course to study bookkeeping at Goldsmith, Bryant & Stratton Business College in Detroit. Fact 8: Who invented the Model T? Henry Ford's passion for machinery helped on the family farm as he took charge of the Westinghouse Farm engine, a portable steam engine, hauled by horses, that became popular on farms during the transition from horses to machinery. Henry Ford soon became an expert on the Westinghouse Farm engine and was hired by the Westinghouse Company as a mechanic to demonstrate and service and their engines. Fact 10: Who invented the Model T? In 1888, Henry Ford married Clara Ala Bryant and briefly returned to farming to support his wife and son, Edsel Bryant Ford (1893-1943). Fact 11: Who invented the Model T? In 1891 the Henry Ford moved his family back to Detroit so that he could learn more about electricity by working at the Edison Illuminating Company. Fact 12: Who invented the Model T? During this time Henry Ford learnt as much as he could about the newly invented automobiles and In 1896 he built his first car, that he called "Quadricycle". The Quadricycle was a 'horseless carriage' using a simple frame, four bicycle wheels, steered by a tiller, with a 4 horsepower, 2 cylinder, ethanol-powered engine. Fact 13: Who invented the Model T? Henry Ford sold his first Quadricycle for $200 in 1896 to his friend Charles Ainsley. The Quadricycle became a commercial success and led to Henry Ford founding the Ford Motor Company in 1903 and began the manufacture of the Model T automobile. Fact 14: Who invented the Model T? The Ford Model A, right red, 2-seat runabout also known as the Fordmobile, was the first car produced by company. The company manufactured 1,750 cars but it was more expensive than its main competitor, the Oldsmobile, which was produced by the Olds Motor Vehicle Co. founded by Ransom E. Olds. Fact 15: Who invented the Model T? Henry Ford steered the company with new ideas and began improving the Ford Model A. Many new models were designed and manufactured up to the Model S. The first Model T automobiles were produced on October 1, 1908. Fact 16: Who invented the Model T? The light, fast, and strong original Model T automobiles were made of Vanadium steel, had 9 different body styles and came in 4 colors; grey, green, blue, and red - not black. The Ford Model T car was designed to appeal to the masses and the first selling price was $825. The Ford Model T car became commonly known as the "Tin Lizzie", the word 'Lizzie' was a slang word of the period used to describe a reliable servant. Fact 17: Who invented the Model T? The Model T cars were easy to operate and drive, inexpensive to repair and the engine was capable of running on gasoline, kerosene, or ethanol. The Ford Model T became so popular that it was selling faster than the company could make them. Henry Ford began searching for ways to speed up the manufacturing process of the car and came to the decision that the Assembly Line technique, invented by his old competitor Ransom E. Olds, was the way forward. Fact 18: Who invented the Model T? Henry Ford improved the ideas pionered by Ransom E. Olds by installing conveyor belts on the Ford Assembly Line. The moving platforms of the Ford conveyor system enabled the chassis of the Model T automobile to be towed by a rope that moved it from station to station in order to allow workers to assemble each part. Fact 19: Who invented the Model T? Henry Ford introduced the assembly line method in 1914 which reduced the production time of a Model T car from 12 hours 8 minutes to just 1 hour 33 minutes. He also slashed the prices of his Model T cars to just $260. Fact 20: Who invented the Model T? The Ford Assembly Line technique enabled Henry Ford to cut prices of the Model T, but another reason for the price reduction was by using black paint. Fact 21: Who invented the Model T? The black paint color used on the Model T was the most durable and also dried the fastest, speeding up production. Henry Ford's most famous quote was "Any customer can have a car painted any color that he wants - so long as it is black!" Fact 22: Who invented the Model T? By 1918 over 50% of all the cars sold in the United States were Ford Model T cars. Ford offered nine Model T body style designs consisting of the Model T roadster, the Model T runabout, the Model T touring car, the Model T roadster torpedo, the Model T town car, the Model T coupe, the coupelet, and the 4-door and tudor sedans. Fact 23: Who invented the Model T? Henry Ford and his Model T car together with the cost efficient assembly line, car ownership, and the freedom it offered, affordable to many Americans in the 1920's. Fact 24: Who invented the Model T? Henry Ford died on April 7, 1947 of a cerebral haemorrhage. He will always be remembered as the innovative businessman who revolutionized American society with his invention of the Model T automobile.